Window Sticker – Honk for Heritage! This versatile window sticker is ideal on a car, tractor or steam carriage, but also suitable for a greenhouse, bedroom window or caravan! You get one FREE with any purchase from the GooseyGoo store! Let people know you support British Heritage by honking about it everywhere you go! The GooseyGoo window stickers are made from a snazzy new reusable, clingy material, so you don’t get nasty glue residue on your window! You can relocate it as many times as you like and not have to get any solvents or soaps out to clean up behind it! Being clingy by nature, you can have it inside facing-out or facing-in! 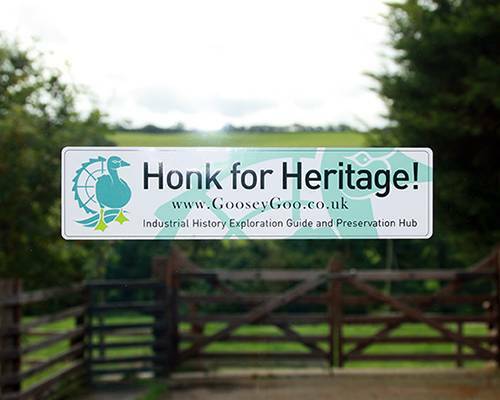 Your Honk for Heritage GooseyGoo window sticker will arrive by normal Royal Mail post in an envelope, within a few days of ordering.